Key Perspectives: The role of imagination in Meditation; How to meditate on words and ideas. It depends on the individual. Everyone has his own particular process. It depends altogether on each one. Some people may have an imagery which helps them; others, on the contrary, have a more abstract mind and only see ideas; others, who live more in sensations or feelings, have rather psychological movements, movements of inner feelings or sensations—it depends on each one. Those who have an active and particularly formative physical mind, see images, but everybody does not experience the same thing. If you ask the person next to you, for instance… (To the next child) When I give a subject, do you see images like that? A sensation, yes. It is more frequently a sensation—I mean generally—more frequently a sensation or a feeling than an image. The image always comes to those who have a formative mental power, an active physical mind. It is an indication that one is active in one’s mental consciousness. (The child who had asked the first question) But is this right? For example, when I ask you to go deep down within yourselves, some of you will concentrate on a sensation, but others may just as well have the impression of going down into a deep well, and they clearly see the picture of steps going down into a dark and deep well, and they go down farther and farther, deeper and deeper, and sometimes reach precisely a door; they sit down before the door with the will to enter, and sometimes the door opens, and then they go in and see a kind of hall or a room or a cave or something, and from there, if they go on they may come to another door and again stop, and with an effort the door opens and they go farther. And if this is done with enough persistence and one can continue the experience, there comes a time when one finds oneself in front of a door which has… a special kind of solidity or solemnity, and with a great effort of concentration the door opens and one suddenly enters a hall of clarity, of light; and then, one has the experience, you see, of contact with one’s soul…. But I don’t see what is bad in having images! The sentence is already a mental formation; the mental formation is made. The sentence is the expression of the mental formation. So when you meditate on a sentence, there are two methods. There is an active, ordinary external method of reflecting and trying to understand what these words mean, understand intellectually what the sentence means exactly—that is active meditation. You concentrate on these few words and take the thought they express and try, through reasoning, deduction, analysis, to understand what it means. There is another method, more direct and deep; it is to take this mental formation, this combination of words with the thought they represent, and to gather all your energy of attention on it, compelling yourself to concentrate all your strength on that formation. For instance, instead of concentrating all your energies on something you see physically, you take that thought and concentrate all your energies on that thought—in the mind, of course. But even without going so far—that implies a rather hard discipline, doesn’t it, a long-standing habit—you can pass quite easily from the thought to the idea, and that gives you a light and an understanding in the mind which enables you, in your turn, to express the idea in any form. An idea can be expressed in many different forms, in many different thoughts, just as when you come down to a more material level, a thought can be expressed through many different words. Going downwards, towards expression, that is, spoken or written expression, there are many different words and different formulas which may serve to express a thought, but this thought is only one of the forms of thought which can express the idea, the idea behind, and this idea itself, if it is followed deeply, has behind it a principle of spiritual knowledge and power which can then spread and act on the manifestation. 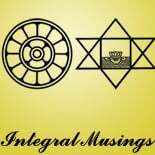 This entry was posted on November 6, 2012 by integralmusings in Words of the Masters.